At a time when the global media portrays IDF soldiers in an unfair, inaccurate light, this article reveals another side of their story, one based on reality. They arrived in Akko early that spring morning, an elite IDF paratrooper unit, exploring the narrow stone streets of this ancient seaside city. As part of their rigorous training, they had already learned how to navigate out in the field; now they had to run and navigate in an urban environment. So they found themselves in Akko, a city in which Arabs, Jews and Christians all manage to reside together. The old city walls that surround the port are remnants from the Crusader period. Centuries ago, Akko was the capital of the Latinate Kingdom of Palestine as it was then called. Ships from far-away Genoa, Pisa and Venice sailed into its harbor. Today the port is home only to small, simple fishing boats. Divided up into groups, the paratroopers started glancing around to get their bearings. Though alike in their olive-green uniforms, with their M16's casually dangling down their backs, one soldier stood out from the rest of his comrades. His name was Dov, which means 'bear' in Hebrew and for him, a most appropriate name. A huge bear of a young man, six foot four without his army boots, his wide shoulders and bulging muscles strained against the fabric of his extra-large uniform. 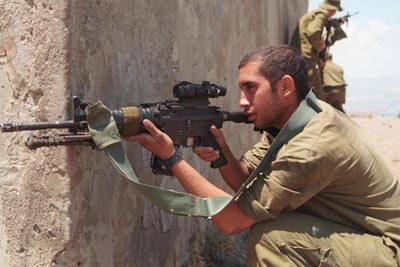 Yet Dov was always cheerful, kind-hearted and popular with his fellow soldiers. Just then a group of young Arab schoolchildren hurried past, chattering rapidly to one another. "I wonder what they're saying?" Yair, one of the soldiers, commented. "They said if they're late for school, they will be in trouble," Dov replied. "Since when do you know Arabic?" Tali laughed. "I learned it in school, just like you did," Dov told him. "Okay, if you know Arabic so well, go talk to one of those school kids," Yair challenged, "and we'll listen into your conversation." He noticed one tiny girl trailing slightly behind the rest of the schoolchildren. She must have been about five but small for her age, with olive skin and short black hair. A fragile little sparrow of a girl, yet she was spunky too. When this enormous Israeli soldier, whose M16 was almost the same size as she, suddenly squatted down in front of her, she seemed unperturbed. Her dark-bright eyes looked directly into his hazel ones. "Hello, cutie, how are you today? My name is Dov. What's your name?" he asked in fluent Arabic, using a soft, friendly tone. The child smiled but did not reply. "Let me guess your name then. Is it Fatima?" "Could it be maybe, Hanan?" "Mm, let me think then…is it Yasmin?" "That's my big sister's name," the child replied. Dov's knowledge of female Arabic names was exhausted. "I give up!" he exclaimed. "My name is Cinderella," the child announced proudly. Dov laughed. "You're joking! Is your name really Cinderella?" "Yes," she insisted. "That's really my name." "Well, Cinderella, it was nice talking to you. Have a good day at school." Dov unfolded himself back to his towering height. The child scampered off, down the narrow stone street. "Well, what do you have to say?" Dov turned to his friends with a smug smile. "Now do you believe I can speak Arabic?" "I guess you do," Yair reluctantly admitted. "Yeah, but you spoke only to a little kid. How hard was that?" Tali challenged. But Dov was still following Cinderella with his eyes. Perhaps she sensed he was watching her for suddenly she turned, gave a quick grin and a wave of her small hand, whirled round again and smashed her head into a stone wall. She cried out in pain and in an instant Dov was beside her. He scooped her up, examined the bump on her forehead, gently wiped away her tears with his huge hand. "Cinderella, don’t cry," he murmured comfortingly. "It's a big bump but it will feel better soon. I wish I had some ice to put on it. That's what my mom did for my bumps when I was a little kid." Cinderella sniffed. "You bumped your head too?" she asked wonderingly. Dov laughed. "Sure, my head may be big but I still get my share of bumps. We all do. Tell me, would a candy help your head feel better?" he asked, fishing inside his uniform pocket and offering her the sweet. She nodded, blinking away her tears, and popped the candy into her mouth. "Now tell me where your school is, Cinderella, and I’ll take you there." She pointed with a tiny finger. "Down that street." The media was totally unaware of this event. CNN was not there to record it, British reporters did not witness the sight, the Peace Now movement was nowhere near. However, this story did come from a very reliable source – my own soldier son, who was there in the narrow streets of ancient Akko early that spring morning.